The universe is vast, seemingly infinite thing, and the Hubble Telescope is here with the latest reminder of that fact in the form of eye candy. This is the first photo from NASA's Frontier Fields project, and it's the deepest we've ever seen into space. The only thing more impressive than the image itself is how it was taken. NASA scientists actually created a sort of naturally occurring zoom lens by using the bending of light that happens when galaxies pull on each other. The big image below shows Abell 2744, a group of hundreds of galaxies some 3.5 billion light-years from Earth. At that distance, we're not just looking at pretty pictures of stars. We're also getting a history lesson. 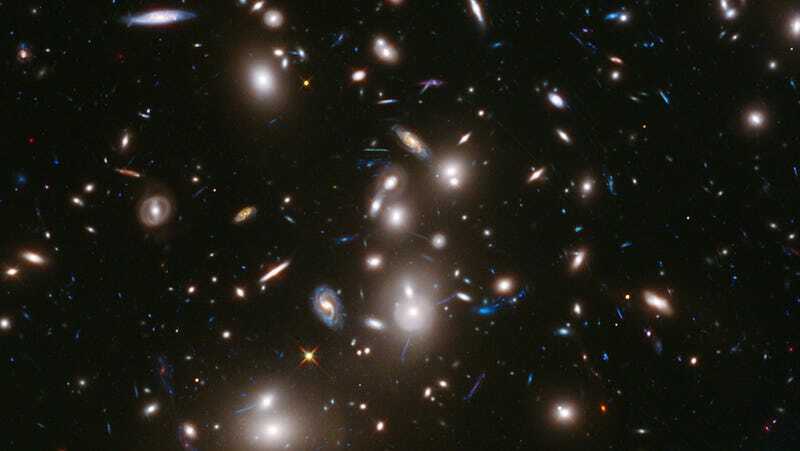 "The Frontier Fields is an experiment; can we use Hubble's exquisite image quality, and Einstein's theory of general relativity to search for the first galaxies?" said Matt Mountain, director of the Space Telescope Science Institute director, in a statement. "With the other Great Observatories, we are undertaking an ambitious joint program to use galaxy clusters to explore the first billion years of the universe's history." It's a real all-star lineup astronomers have put together for this ambitious initiative. The Great Observatories to which he's referring include the Hubble as well as the Spitzer Space Telescope and Chandra X-Ray Observatory. NASA plans to combine images from all three. It's kind of like the Voltron of telescopes. And it's completely awesome.